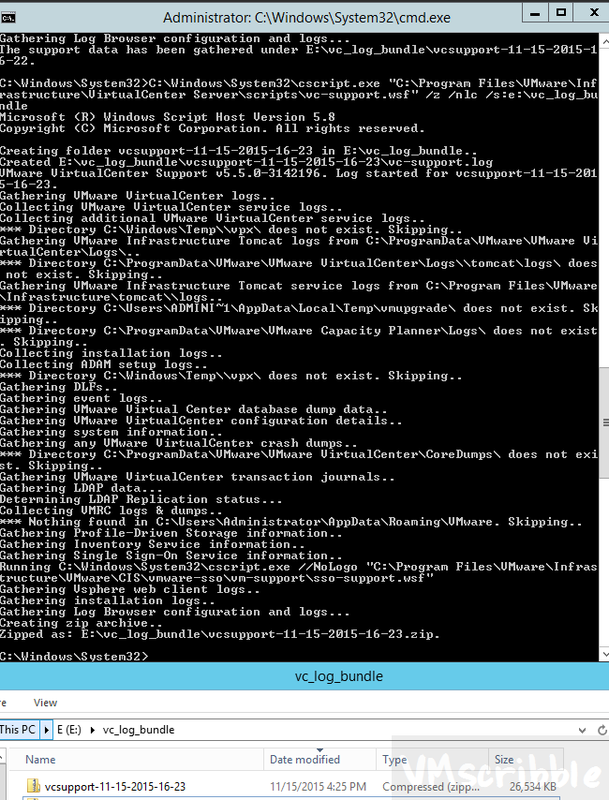 If you generate a vCenter Server 5.5 Log Bundles via the C# client on your PC or by clicking start/programs/vmware/generate vcenter server log bundle; the temp files are written to the windows vcenter server c:windowstemp folder. This can fill up the C drive causing an vcenter outage. (optional) Remove /nlc from the above command if you want take a live core dump of vpxd (this is risky as it can hang or crash vpxd aka the VMware VirtualCenter Server). This will write the files to E:vc_log_bundle, zip them to a vcsupport-date***.zip file in the same folder and remove the temp files. TIP – You can map a network share to a new driver letter on the window vcenter and write the vcenter log bundle to it if the server does not have access to the internet to upload the zip file.